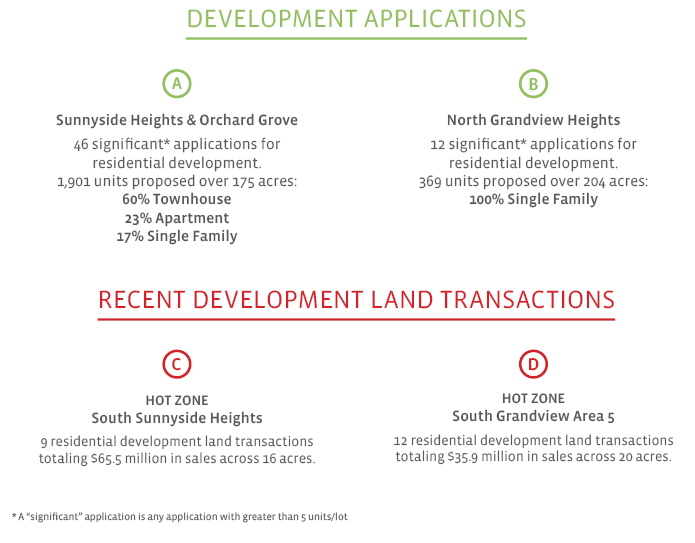 Below is our annual State of the Market report on residential development in South Surrey. In this report we look back at 2018’s market activity while looking forward to what 2019 will bring. Included in this report is a highlight of the in-process development applications and sale activity of residential development land in the area. Most importantly, we have included an update on the development status of the various neighbourhood plans in South Surrey. South Surrey continues to be a sought-after community for residential land investors and home builders but demand has faded. This was caused by a general softening of the market, decreases in home sale prices and an increase in the risks brought on by a new mayor and council that show signs of being less amenable to development than their predecessors. Combined, this is putting downward pressure on land values in many neighbourhoods and investors and builders are apprehensive to make purchases. Development that is currently in process will keep South Surrey an active community through 2019 but with rumours that a number of new neighbourhood plans have been placed on hold, we anticipate a continued deceleration of development and transaction activity this year. We have mapped the current development applications (green outlines on the below map) in South Surrey to identify the areas with the highest concentration of future development and to monitor trends from year to year. 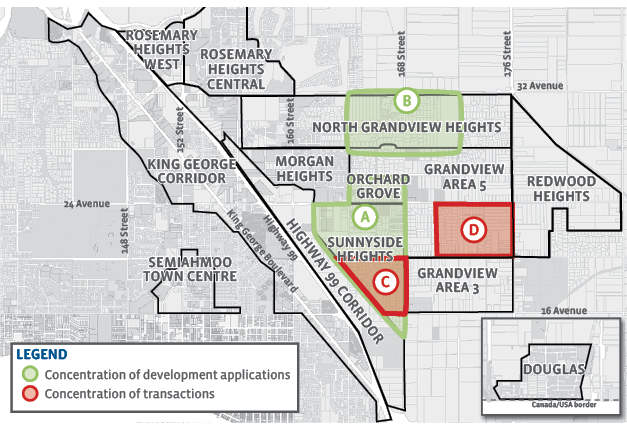 The vast majority of new development continues to be in Sunnyside Heights and Orchard Grove and with uncertainty around the timeline of neighbourhood plans for emerging neighbourhoods, like Grandview Area 3 and Redwood Heights, we may see minimal expansion east of 168 Street this year. The red highlighted regions (on the below map) represent high concentrations of recent residential development land sales. Historically, development follows closely behind high concentrations of transactions but this may not be the case if new neighbourhood plans stall. The flurry of construction is expected to continue in 2019 as projects approved by the previous council are built. It’s unclear whether Sunnyside Heights will be one of the neighbourhoods in which Surrey’s new council plans to pause development. School capacity remains a chief concern of council, despite the site on 165A Street and 20 Avenue being acquired for a new elementary school, so density will continue to be scrutinized. The new neighbourhood plan is unofficially on hold. City staff made significant progress in 2018, hitting timelines for a draft land use plan early in 2019, but Surrey’s new council is not interested in advancing the plan. This uncertainty is likely to negatively impact land values in the area. In 2018 the neighbourhood plan saw several revisions resulting from a review of the traffic network. The revised plan was completed in Summer 2018 but council did not want to approve it so close to an election. The new mayor and council are equally disinterested in reviewing the plan so planning staff have unofficially put the plan on hold until council indicates otherwise. 2019 should bring continued construction as most of the area has been purchased by builders. A few remaining applications yet to receive approval are making progress and should come to council this year. Among them, a revision to an application for a mixed-use condo building that the community uncharacteristically did not support. City staff anticipate it will be status quo in Grandview Area 5 for 2019. Very little attention is expected to be paid to the neighbourhood by city staff and until a neighbourhood plan is completed, development cannot proceed. The same applies to the rumoured, unofficial Grandview Area 5b, for which a neighbourhood plan petition was denied. The lack of progress is likely to continue to have downward pressure on land values. Development continues to move from west to east with 165 new lots receiving conditional approval last year, between 164 Street and 172 Street alone. Despite this activity, City staff anticipate some time before development proceeds as the required sanitary pump station is unlikely to be built ahead of the approval of the Redwood Heights plan as the pump station also services Redwood Heights and would be too expensive for builders from just one neighbourhood to fund. 2018 was another busy year in the northern portion of the Corridor with condo and townhouse project launches from Quadra Homes and Park Ridge Homes. The City continues to receive requests for amendments to the King George Local Area Plan which tend to receive positive feedback from staff as the plan is dated and rapid transit along King George rationalizes density. 2018 was an uneventful year with minimal new development activity. 2019 is anticipated to be similarly uneventful, aside from City staff expecting continued discussions regarding a pair of large commercial developments in the south end of the plan, particularly the commercial site at 164 Street and 18 Avenue. 2019 should bring more construction in Douglas as the neighbourhood continues to develop and build-out. Activity in 2019 may also include the construction of the new school which has finally been officially funded. Last year, work began on updates to the land use plan for Semiahmoo Town Centre, including extensions of the plan boundaries. Another public open house was held on the 28th of February to collect additional feedback ahead of the new draft land use plan. History would dictate we can expect to see an increase in demand for development land in the area, as neighbourhood plan updates often reveal new development opportunities. Development activity in 2019 is expected to be focused around the recently approved revisions to the land use plan along 156 Street as a number of new applications came forward in 2018 and the applications that had recently been delayed can proceed. These neighbourhoods are substantially built out. In creating this report we consult City of Surrey planning and engineering staff, survey multiple land transaction reporting systems and analyze municipal development data to bring you the most relevant information. If you have any questions, don’t hesitate to reach out.